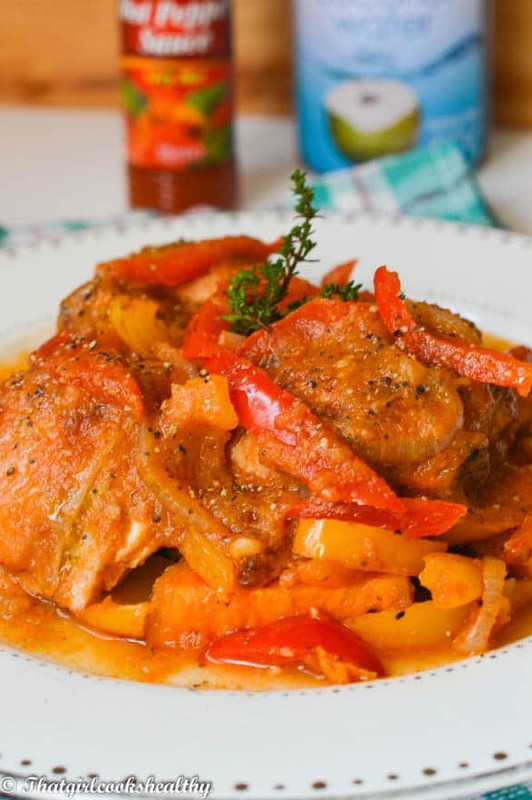 Haitian stewed chicken recipe – This dish known in French creole as poulet creole is spicy chicken thighs seasoned and simmered into a satisfying stew. The temperature is about to increase tremendously in here today. If you’re a big fan of hot and spicy food, you’re at the right place, so take a seat. 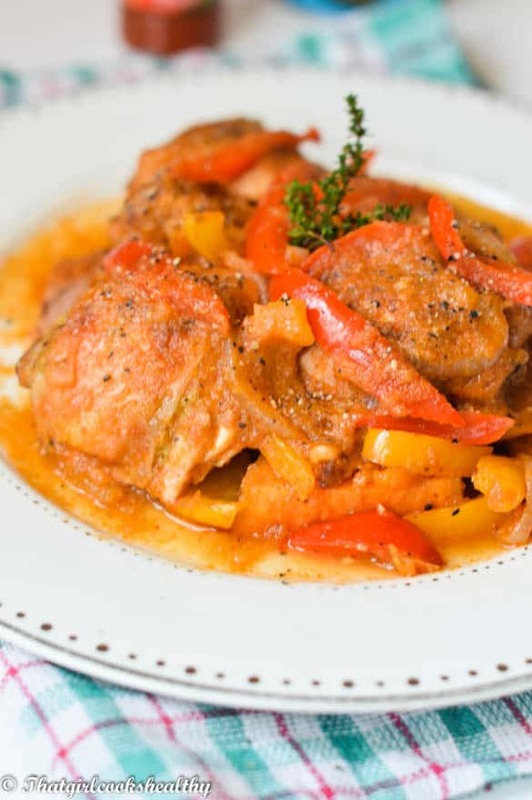 I’m referring to this spicy Haitian stewed chicken recipe, one which is highly regarded and noted for it’s extra heat. Poulet creole which translates as chicken made creole style is full of so much flavour it’s unreal. 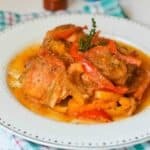 I’ve been cooking this specific Haitian stewed chicken dish for some time now and just can’t seem to get enough of it. When I started blogging I recall making a promise to myself to add this recipe to the blog, as I know it will be a hit with anyone who adores spicy Caribbean food. The biggest challenge was the precision of the measurements, ensuring that all the flavour comes through with the level of heat. What you’ll find with a lot of Caribbean cooking is that we have a tendency to marinate the meat dishes overnight as opposed to marinating for a number of hours. Of course this isn’t a general rule of thumb, simply a cultural observation for the most part. As a Caribbean custom, when cooking meat there are number of ways to clean it; sour oranges (Haitian), lime and vinegar or lime and salt. This a cultural method used to eliminate rawness and neutralise the meat – massage the meat with limes/vinegar/salt, add to a bowl of water to remove further impurities, cut off excess fat/grit with a knife, rinse in more water and discard the waste. Now let me talk you through the recipe; the chicken should be infused with the foundation of the recipe overnight. What you’ll notice is the marinade which serves as the base has a trend of green produce – parsley, thyme, green pepper, scallion, lime and we have the pink salt, garlic and the star of the show – Mr scotch bonnet, where you’ll procure all that heat. 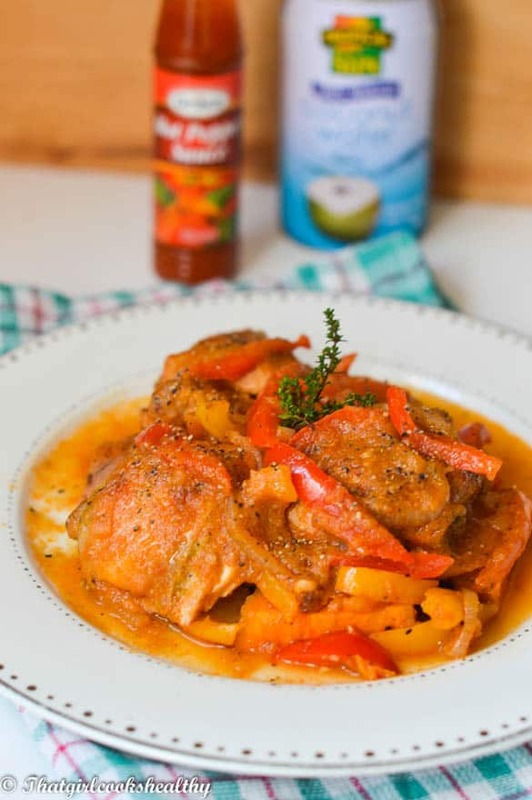 Is it possible to make poulet creole without the excess heat? Yes, there is the option of omitting the heat, if you’re not a fan of hot food. Admittedly, this is not something I’ve tried but the flavours from the base will be more pronounced. Alternatively, there’s always the option of using only half of the scotch bonnet for mild heat. It’s important to note that the chicken needs to be removed from the marinade for browning, using either the frying pan method or baked in a oven, As I wanted to limit the amount of oil being used I choose the latter. This is more timely, but a healthier option, and worth it. In the meantime, it’s a great idea to get the prep work going. 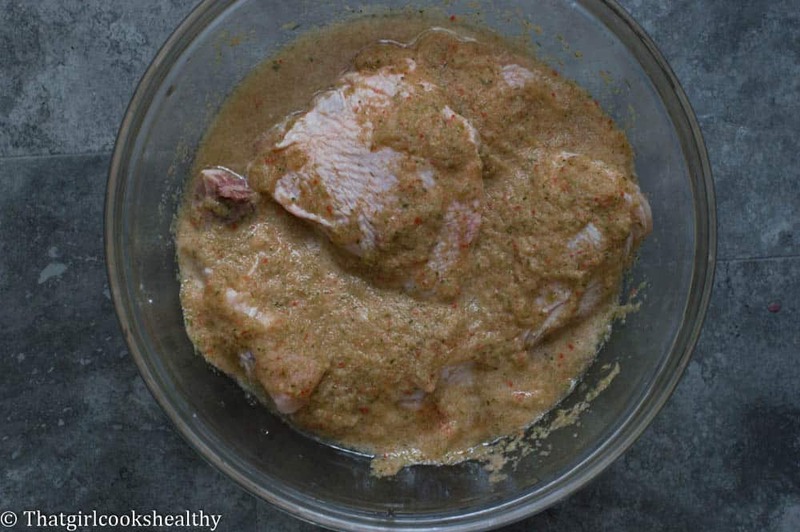 Allow the marinade to infuse overnight or for at least several hours. The longer the chicken is left to infuse the wet rub the more flavoursome the chicken when cooked. Scrap of the excess marinade, but set aside in the refrigerator for later on. 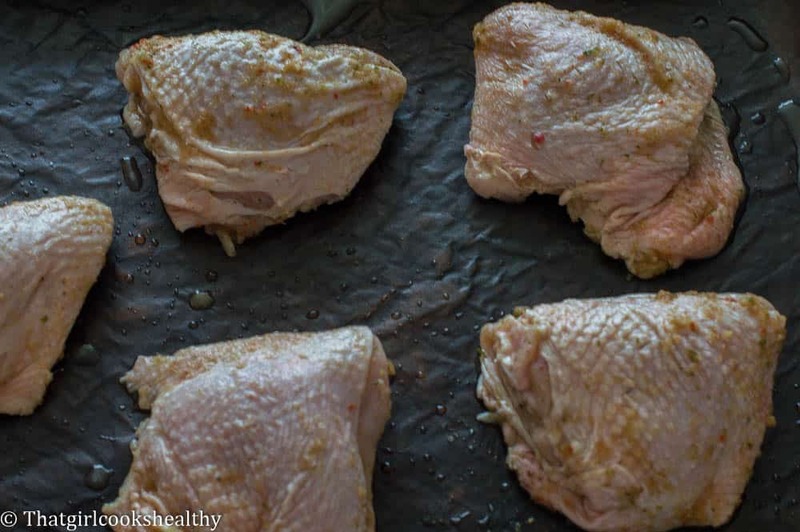 Place the chicken on a lined baking tray if you are oven roasting the chicken as opposed to frying. If you have a dutch oven feel free to use it, but a deep frying pan is suitable too. The final stage is transferring the chicken from the oven (assuming here) to the frying pan with the marinade and allowing the onion, peppers and chicken to braise for 20-25 minutes. Go on what are you waiting for………get in that kitchen and commence cooking pronto! Puree the scallion, garlic, green pepper, parsley, thyme, pink salt, lime, scotch bonnet with 1/2 a cup of water in either a blender or food processor. Pour the mixture onto the chicken and allow the chicken to be infused overnight. 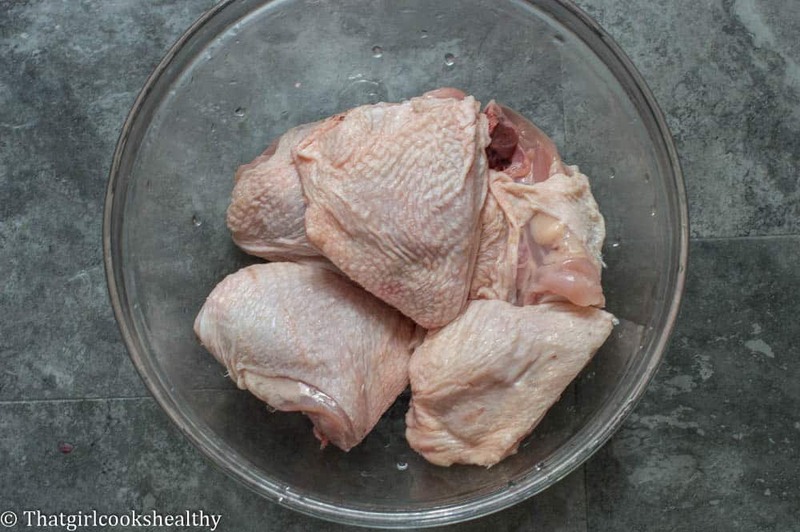 Line a roasting pan with aluminium foil and use a tong to carefully remove the chicken from the marinade. If using the fry pan/dutch oven method simply brown the chicken for 8-10 minutes on medium heat. Roast the chicken in the oven for roughly 45 minutes, turning half way through to brown each side. Put the marinade back in the refrigerator until needed. 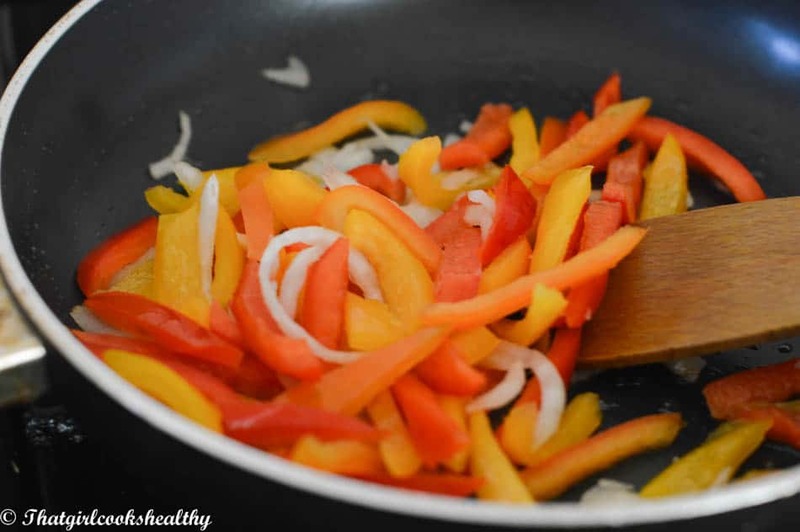 In the meantime heat the coconut oil on medium heat and sautee the bell peppers with onion for 10 minutes, stirring until soft. Add the tomato continuing to sautee everything for another minute. Add the green marinade, 1 cup of water and browned chicken. Bring to the boil and reduce heat allowing the meat to braise for 20-25 minutes until tender. Half way through cooking time season with additional pink salt, black pepper and gently stir. THere is only one word to describe this stewed chicken- DELICIOUS. Can’t never get enough of this . Your pictures make me want to grab a fork and start eating. Thank you so much Imma, your comment really means a lot to me. I’m also a huge fan of stewed chicken too. Omgg!!! You have no idea how I’m happy tO have found your recipe!!! 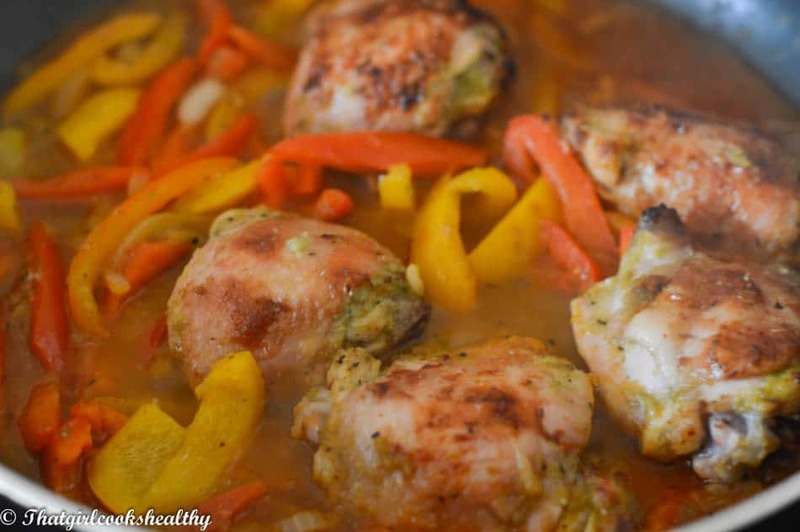 I absolutely LOVE a Haitian food especially chicken with sauce but since it is rather an unhealthy dish with all the oil and salt the way it is typically made, it is usually my cheat meal or a guilty pleasure loll I have always wanted to make it myself in a healthier version but sadly, it’s impossible to find such thing. It’s as if healthy and Haitian does not go together lol anyway thanks again, I will definitely try out this recipe! If it turns out good, my man will be very happy too as he loves Haitian chicken as well. Thank you for such a wonderful comment Irene. I hope your partner likes the Haitian style chicken, it’s a hit! I cannot wait to try this, it sounds absolutely delicious! Thank you for sharing! 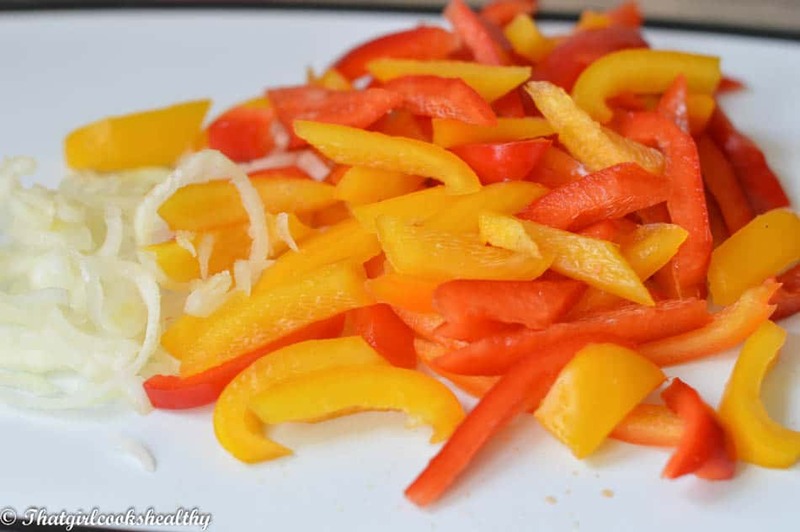 Love the colors in all your pictures–so indicative of flavor! I prefer the excess heat lol. Thank you! Another heat seeker, great!